Ubisoft Won't Ship Yearly Assassin's Creed If "It's Not Good Enough"
Ubisoft North America president Laurent Detoc is open to the idea of delaying an Assassin's Creed game if it's not up to their standards. By now, it's no secret that Ubisoft's Assassin's Creed franchise is an annualized series; but don't think that the publisher will force a title out just to meet its deadline. Speaking to IGN, Ubisoft North America president Laurent Detoc claims that they're open to delay a yearly entry into the series if "it's not good enough" or if they end up with a "70% Assassin's Creed" game. "If we think we've ended up with a 70 percent Assassin's Creed game, we're not going to ship it," claims Detoc. "That damages the brand. I'm not going to give you the names of products, because you know them as well as I do, but if you start to make games at 70 percent, even with a big brand, eventually people are going to change their mind about that brand. They won't want it anymore. That's what saves the recurrence." 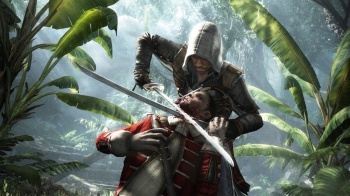 Since 2009, Ubisoft's stealth-action game has seen a yearly release and that hasn't been deterred, even with the publisher releasing the latest AC game, Assassin's Creed IV: Black Flag, on next-gen consoles. Do you think Ubisoft should put the Assassin's Creed franchise on hiatus before they dilute the brand or should they keep to their yearly schedule provided the quality is there?